The kids have been bugging me to get fish for some time. I have wanted to get some fish, but have nowhere to put them. I have also thought of doing a simple aquaponics set up, but that is a different type of fish altogether and the kids would most likely not be allowed to go near this. Then our pet turtle died, we had him since before the kids were born. I don't know what went wrong. The kids and I were upset. We miss out turtle friend. A few days later we happened to be going to Orange for something so I decided to get some fish as a surprise for the kids. I considered getting gold fish as they are hardy and indestructible, but they are also very messy, and they do not breed easily in a tank. I decided to get something that would breed without much work on my part, something like a guppy. 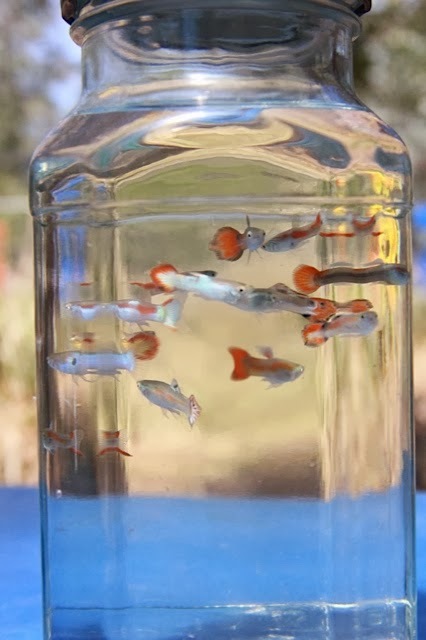 I have liked guppies since I was a child, but a few years ago I learned about a fish called an Endler's livebearer. It is uncertain if this is a type of guppy or a different type of fish. They are prettier, hardier, and all round better than guppies. I wanted to get some Endler's, but it is unlikely that we would find them out here, and they can be very expensive so if I did find some I did not like my chances of actually buying any. I looked online and found someone in Orange who was selling endlers for a good price. 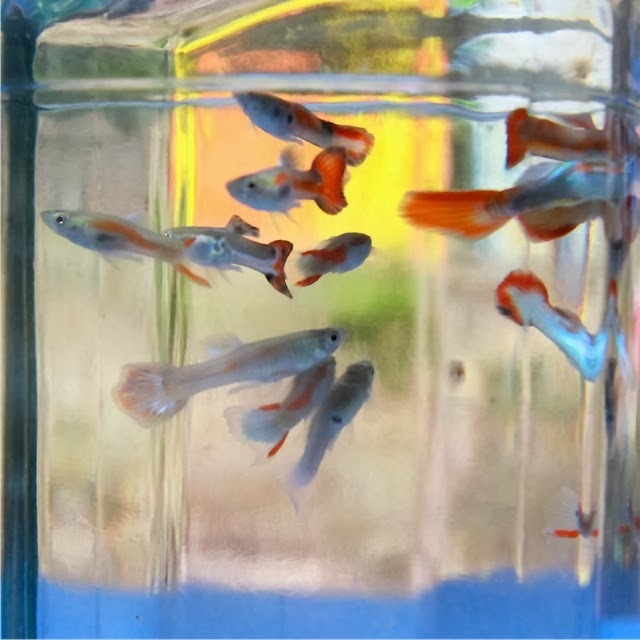 Guppies in town cost about $6 or $7 each, so buying from a private seller worked out a lot cheaper and I ended up with a far larger colony to start with and I got the endler fish that I prefer to guppies. The fish were all young, and were a mix of male and female endlers as well as endler/guppy hybrids. They did not look overly great, mostly grey, one male had nice colours so I was happy. I found out later that when they are stressed they lose colour pretty much immediately, when they had calmed down they looked amazing. Kind of like a container of beautiful swimming jewels darting around. When we got home and I put them in the fish tank the males displayed brilliant neon and metallic colours, very different from the dull fish that I picked up two hours ago. They have had baby fish for us a few times, many of which appear to be surviving to maturity. It is difficult to count them as the tank is large and has plants and other places for them to hide. Unfortunately I have too many males, or not enough females, so I have separated all of the non-endler male guppies from the main breeding tank. In this way the colony will end up as all endlers. Every baby fish from now will be either an endler or at least 50% endler. In a few generations if I cull hard I should have all endlers, or at least fish that look very much like endlers and carry a high percentage of ender genes. It will take some work, especially considering how speedy these little fish are and how difficult they are to catch, but it will be worth it. 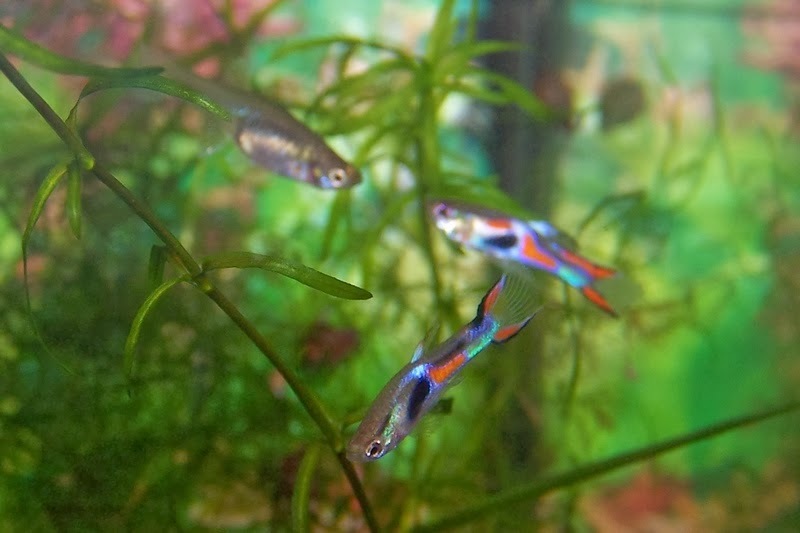 Endler's livebearers (Poecilia wingei) may be a subspecies of guppy, or they may be their own separate species of fish. There is a lot of scientific debate and controversy over this. They have been classified as their own species, it is safe to assume that this is partly for conservation purposes. The fish that I have not culled look like the original ones from the wild, they have not had any selective breeding done in order to change them. I think that this wild type fish is one of the most beautiful fish around. People often try to hybridise them with guppies, I feel that this is a mistake as none of the hybrids look as amazing as the wild type fish and de-hybridising them without a lot of work is virtually impossible. In the wild they lived in Laguna de Patos in Venezuela, they may be extinct in the wild, or they may have crossed with guppies in the wild (essentially becoming extinct in their pure form), or they may have some small remnant populations somewhere. Many people who have recently caught wild Endler's have fish that are clearly wild guppy Endler hybrids. Many of the recent expeditions have not turned up any Endler's, and the site they they used to reside is heavily polluted, so it is difficult to know if they still exist in the wild for sure. The Endler's livebearer was first 'discovered' by Franklyn F Bond in 1937, these fish were then pickled, sent to a museum, filed away safely, and then forgotten about. In 1975 Professor John Endler 'rediscovered' these amazing little fish, he sent some live fish to a friend who named them after him and introduced them into the aquarium trade. From there they have spread across the world through aquariums. 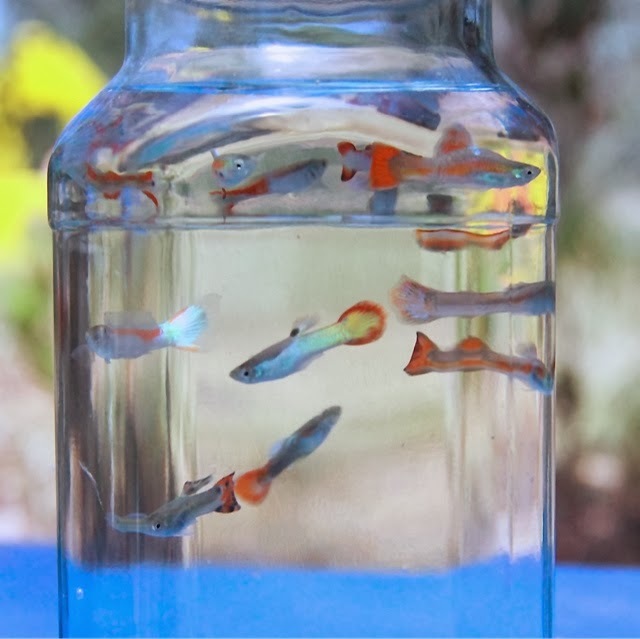 In Australia they seem to be rare, probably due to how recently they have been introduced to the country but also because of how easily they hybridise with guppies. They are a beautiful and lively little fish, the males have vivid metallic colours while the females are plain. They are very similar to the fancy guppy in a lot of ways. 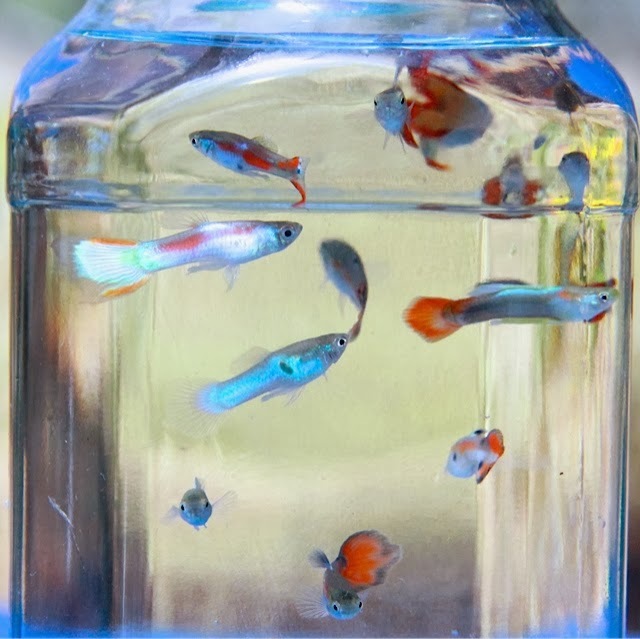 Many of the modern fancy guppies have some degree of Endler blood in them, and likewise many (if not all) Endler's in Australia have guppy somewhere in their heritage. I really like these little fish, they are interesting to watch. They quickly learn that people equate to food and begin to frantically beg wneh they see you, even if they are not hungry. They seem to be breeding well for us in conditions that are less than ideal and I can only begin to imagine how well they would do in perfectly clear water with stable temperatures and adequate lighting. If they survive the summer I hope to have enough to be able to sell some, trade some, perhaps keep some in with the water chestnuts during the warmer seasons or even feed some to the poultry. 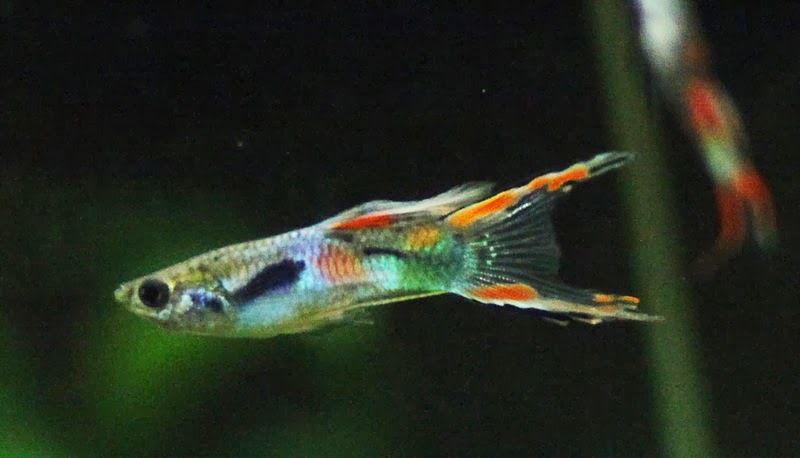 I have tried to take pictures of the Endlers and the endler/guppy hybrids but have had no luck. They are far too speedy for me. I tried putting some in a jar so that they could not escape the camera but they lost their colour as soon as I caught them and did not colour up again until I put them back in their tank. Above are some of the best pictures that we took, and they have no real colour compared to the lively little fish as soon as I put them back in the tank. I have learned a few things about expensive guppies and "pure" endlers from my little tank. 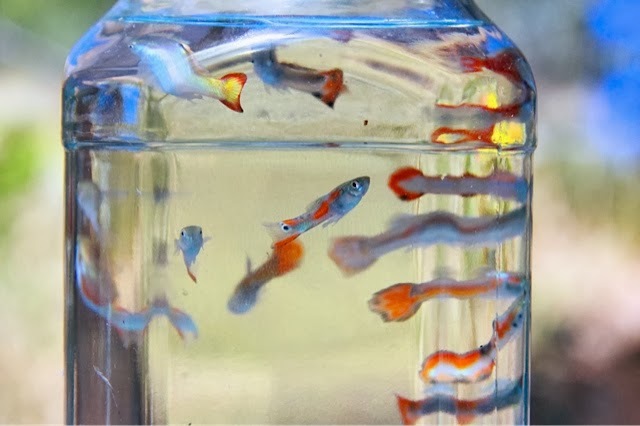 Some of the expensive guppy types are in fact hybrids with endlers, I have had a few 'Japanese neon blue' guppies and a few other noticeable types appear in my tank. Some of the 'pure endlers' that I see for sale overseas that have been collected from the wild, are in fact hybrids. I assume that they hybridised naturally prior to being caught by people, but the fact remains that they are not pure endlers. Again, in my little tank, I have had a few 'peacock endlers' and some other things show up. Some of these fish are truly beautiful and it would be simple enough to line breed them for a few generations so that I had several exotic types that breed true to type, but I have no interest in them. The natural beauty of the wild type endlers has captivated me and I am culling hard to remove anything that is not close to a real endler. At this stage I have no plans on sending live fish through the post, so if you would like to get them from me feel free to contact me through my for sale page but you would have to pick them up.